Make your selections below to check rates and make a reservation at Whalers Rest RV & Camping Resort. Small studio cabin with queen bed and set of single bunk beds. Dining room table with 4 chairs. cabin includes Satellite TV with DVD. Hotel style kitchen includes microwave, sink, toaster, coffee pot, small refrigerator & outdoor BBQ grill. Dinnerware, silverware & glasses are included. No cookware is included. Bathroom with shower. Linens rentals (bedding and towels) are available for an additional fee. No pets in these rentals, please. We do not allow pets in some accommodation types; however, we do allow service animals and a service animal may have stayed in this rental. Small studio cabin with queen bed and set of single bunk beds. Dining Room table with 4 chairs. Rental includes Satellite TV with DVD. Hotel style kitchen includes microwave, sink, toaster, coffee pot, small refrigerator & outdoor BBQ grill. Dinnerware, silverware & glasses are included. No cookware is included. Bathroom with shower. Linens rentals (bedding and towels) are available for an additional fee. 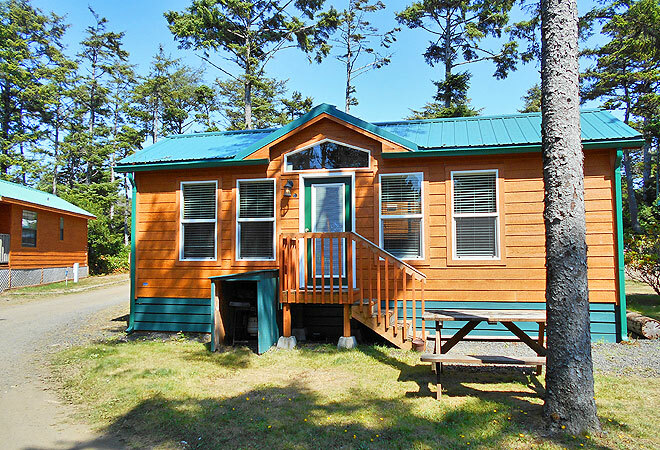 Pets are allowed in this cabin for a $10 per pet per night fee, with a cap of $50 per stay. The garden homes sleep 8 people. It includes a bedroom with queen bed and dresser and a second bedroom with 2 twin beds and dresser. There are two full size futons in the living room. $10/person/night for occupants #7 and #8. More than 8 occupants requires additional rental. A 9% Lincoln County occupancy tax applies. This rental has a private bedroom with a queen bed and a second bedroom with single bunks. Open living room featuring a kitchenette table and four chairs. Full size sleeper sofa in living room. Bathroom with tub/shower. Living room includes color flat screen TV with DVD. Fully stocked kitchen includes oven & microwave. Gas BBQ grill outside. Linen packs are available for rent. Maximum 6 persons. Occupancy is 4, add $5 per person over 4 (more than 6 requires additional rental). This rental has a private bedroom with a queen bed and a second bedroom with single bunks. Open living room featuring a kitchenette table and four chairs. Full size sleeper sofa in living room. Bathroom with tub/shower. Living room includes flat screen color TV with DVD. Fully stocked kitchen includes oven & microwave. Outside gas BBQ grill. Linen packs are available for rent. 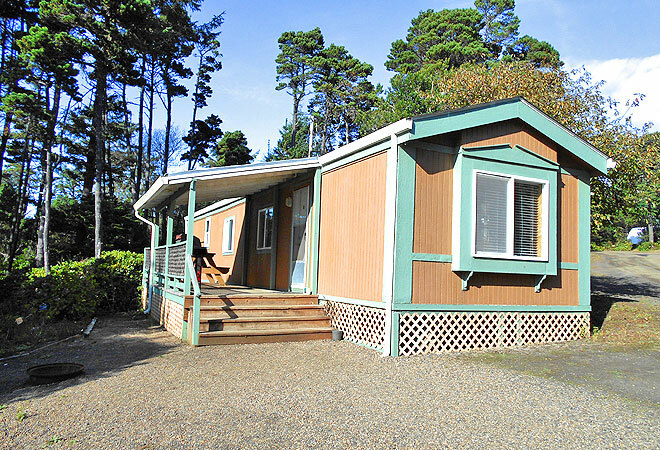 Pets are allowed in this rental for a $10 per pet per night fee, with a cap of $50 per stay. Boasting a bedroom, this Thousand Trails cabin sleeps 4 people and include a queen bed and a two-person futon or couch in living area. No oven in kitchen. Linens not included but two-person bedding and bath towel packages are available to rent; please request when booking. (Max occupancy is 4. More than 4 will require additional rental). The Thousand Trails cabins sleep 4 people and include one bedroom with queen bed and one two-person futon or couch in living area. No oven. Linens not included but two-person bedding and bath towel packages are available to rent; please advise when booking. Maximum occupancy is 4. More than 4 will require additional rental. A 9% Lincoln county Occupancy tax applies..
Pets welcome for an additional fee. Boasting a private bedroom, this Thousand Trails cabin includes a bunk bed (full size on bottom, twin on top) plus a full size futon/sleeper sofa in living room. Linens packs available to rent. Maximum occupancy 5 persons. More than 5 requires additional rental. Boasting a private bedroom, this Thousand Trails cabin sleeps 5 people with a bunk bed-style double bed (on bottom) and single bed (on top) plus a full size convertible couch in living room. No oven. Linens not included but two-person bedding and bath towel packages available to rent; please request when booking. Pets welcome for additional fee. This rental has a private bedroom with a queen bed and a second bedroom with single bunks. Open living room featuring a kitchenette table and four chairs. Full size hide-a-bed in living room. Bathroom with tub/shower. Living room includes color flat screen TV with DVD. Fully stocked kitchen includes microwave. Outside is a BBQ grill. Linen packs are available for rent. Maximum 6 persons. Occupancy is 4. add $5 per person over 4 (more than 6 will require additional rental). This rental has a private bedroom with a queen bed and a second bedroom with single bunks. Open living room features a kitchenette table and four chairs. Full size sleeper sofa in living room. Bathroom with tub/shower. Living room includes flat screen color TV with DVD. Fully stocked kitchen includes microwave. Gas BBQ grill outside. Linen packs are available for rent. Pets are welcome in these rentals for an additional charge. Ask for pet-friendly rental when booking.